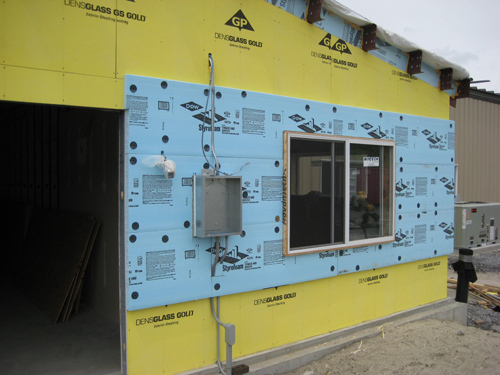 I recently wrote an article, How To Install DensGlass Exterior Sheathing On Metal Studs, which detailed the use of DensGlass Sheathing on exterior metal stud walls behind a brick veneer. Now we are installing a layer of 2-inch thick Dow Foam Board over the DensGlass sheathing prior to installing the brick veneer. 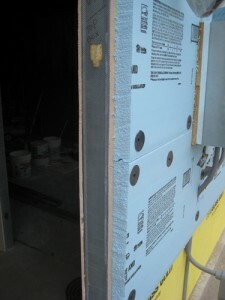 R-11 Fiberglass insulation inside 3-5/8 inch 20 ga. metal studs. 2-inch thick Dow foam board. We are installing a layer of 2-inch thick Dow Tongue and Groove Styrofoam directly over the DensGlass exterior sheathing. Installing the 2-inch thick foam board is really easy. We use 3-inch long screws with a large 2-inch diameter plastic washer (see photo). 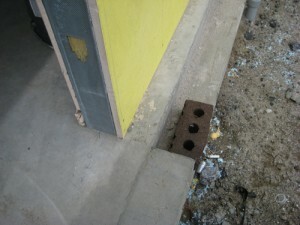 The screws help hold the insulation in place and keep it from moving after the brick is installed. 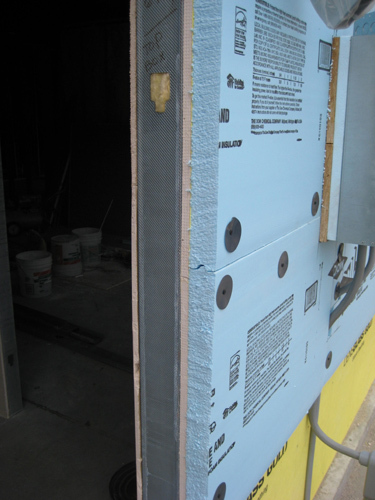 Once all the foam board is installed we’ll tape all the seams with Tyvek tape to help keep an air-tight installation. All of the joints at windows and door frames will be sealed using spray foam. As you can see in the photos we’ve left off the lower 2-feet of foam board. We need to wait for the mason to install flashing at the base of the wall, once that’s installed we can install the lower 2-feet of foam board. After all the foam board is installed the building will be ready for the brick facade. The brick is supported by a concrete brick shelf that’s incorporated into the foundation wall. As you can see in the photo the foundation wall is notched out to create the brick shelf. There will be a 2-inch air space behind the brick. The brick will have brick ties that get screwed into the metal studs. Once the mason starts laying brick I’ll take some more photos so everyone can see how the entire wall section looks. Thanks for this post. It gives me some idea of what we’ll need to do when adding stone to the outside of an addition to the Stone House project. @ Baba – You’re quite welcome! Dealing with masonry and stone is certainly different than traditional siding. If you have any specific questions please don’t hesitate to ask. Corey – Certainly sounds like bad and/or missing flashing at the brick/foundation interface. To fix this properly you’d have to remove some brick and that’s not going to be easy. Probably the first way to approach this is trying to get water away from that area. Gutters, grading, cleaning up overgrown landscaping, etc. If you can get the water away you may just solve the problem. Building a bolt together steel frame home. want to use Polar Wall Plus Vinyl Siding over steel studs. Want to use densglass as sheeting. I am in a hurricane zone. Any remarks or advise? Wray – First off I would recommend discussing this issue with your local building official. I’ve never dealt with a similar situation but my gutt reaction is not good. I guess it depends on whether your “steel frame home” is structural by itself or will it rely on sheathing? If it needs sheathing for shear strength then I’m not sure Densglass is appropriate. Again..this is just my gutt feeling and I think you need to reach out to the local building official and possible Densglass.